After having crossed Vietnam from South to North, passing through amazing places such as the Mekong Delta, Saigon, Hoi An, Cat Ba island, and Hanoi, we finally ended our Vietnamese trip in the Extreme North. 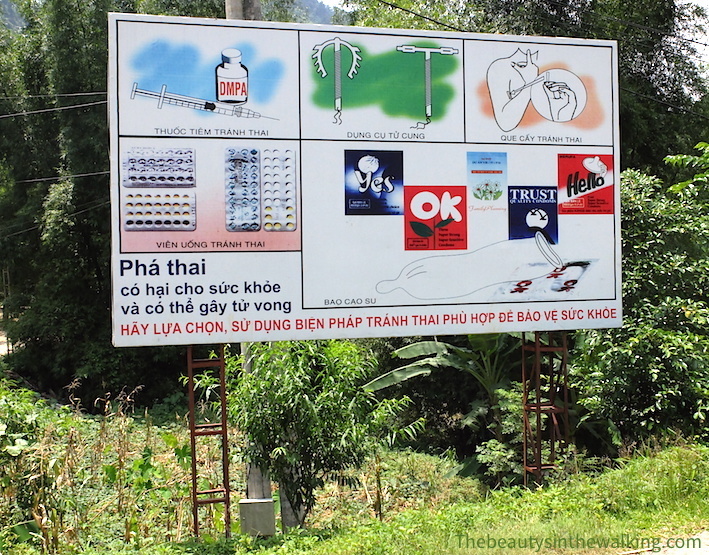 We did a 4-day loop on a scooter throughout the Đồng Văn Karst Plateau Geopark, leaving Sapa aside fearing that it would be too touristic. 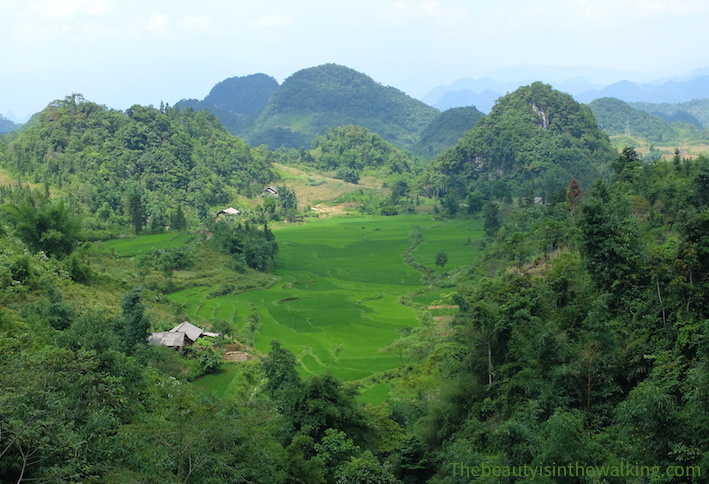 It’s called the Hà Giang Loop and it’s a must. Protected since 2010 by UNESCO, this park offers gorgeous well-preserved sceneries, where local communities still live in a traditional manner. 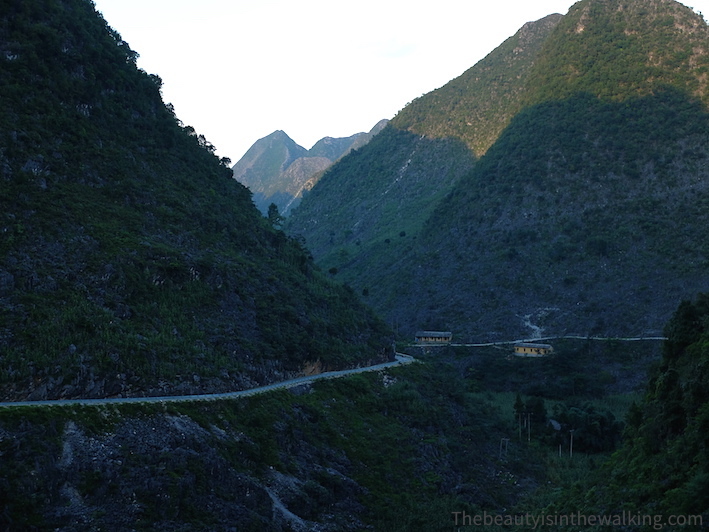 Among the loops we already did in Southeast Asia – Thakhek and the Bolovens Plateau in Laos –, the Hà Giang Loop is by far the most beautiful, impressive and authentic we’ve ever done. Incidentally, this is one of our greatest travel memories. Here is our fantastic road trip in two episodes. 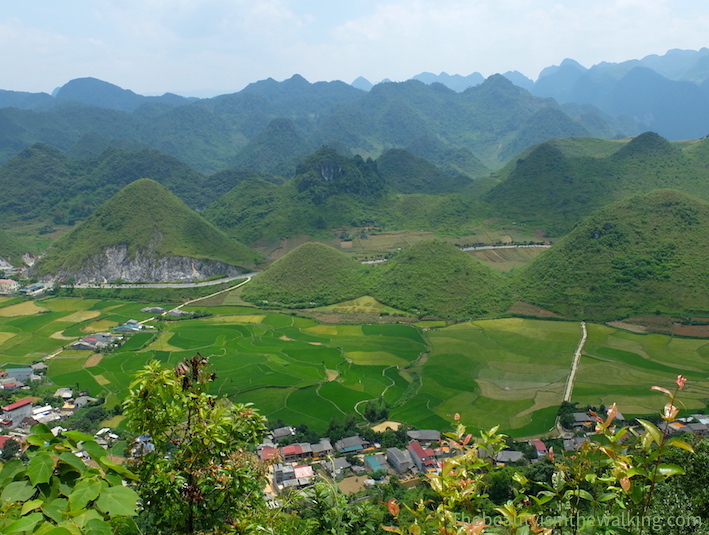 Founded in 2009, the Đồng Văn Karst Plateau Geopark was listed on the Global Geopark Network (GGN) in 2010. 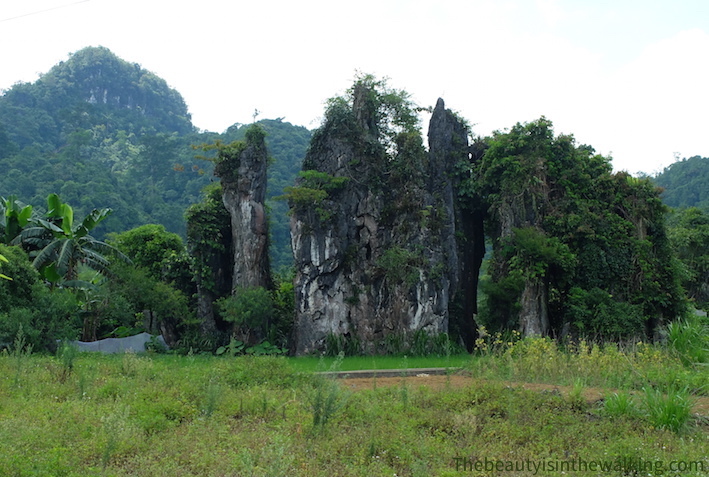 This is the first geopark in Vietnam and the second in Southeast Asia. 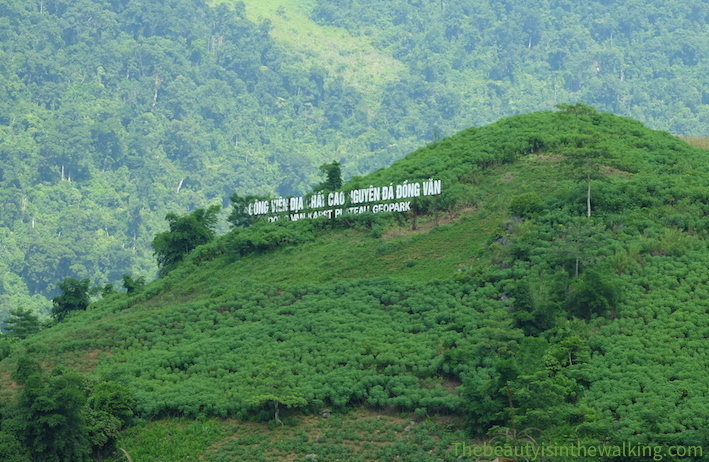 It spreads on 2326 square kms over four districts – Quản Bạ, Yên Minh, Đồng Văn and Mèo Vạc – in the Hà Giang Province. Around 60% of its surface is covered with limestone. The park has a geological and biodiversity heritage, as well as several ethnic communities. 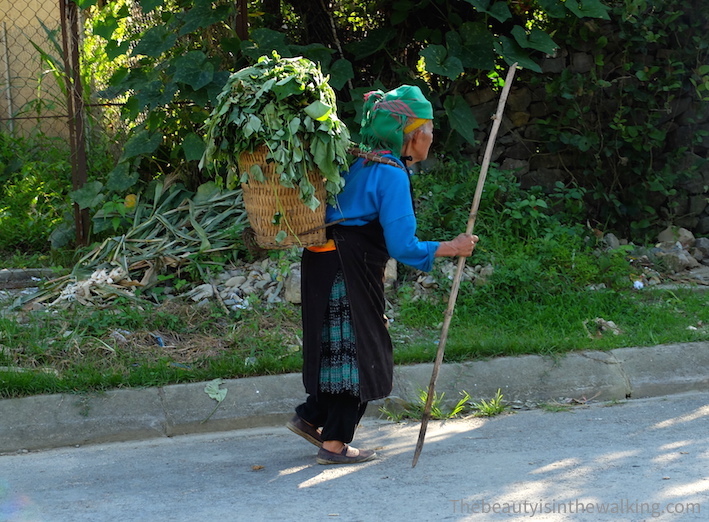 The Hmong people represent 70% of the population among the 17 communities that live on this territory. We jump off the bus, whereas our eyes are still a bit sticky. It’s 4:30 in the morning and we set foot in the town of Hà Giang. Strangely, there are people in the streets. But at this early hour, we just have one single idea in mind: finding Johnny, the man who rents scooters. We had barely stepped in the shop when another French couple came in too. 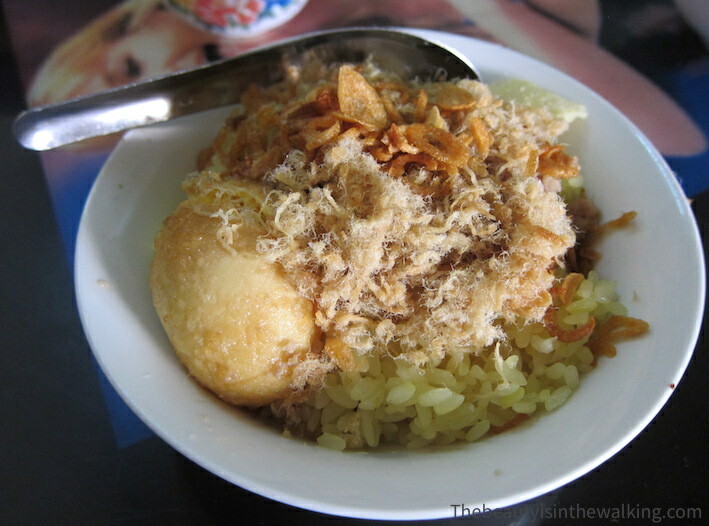 We will have a coffee and a bowl of rice and dried fish altogether before leaving for our ride. But in the meantime, we pack a minimum of stuff in our smaller backpacks and jump on our semi-automatic scooter. 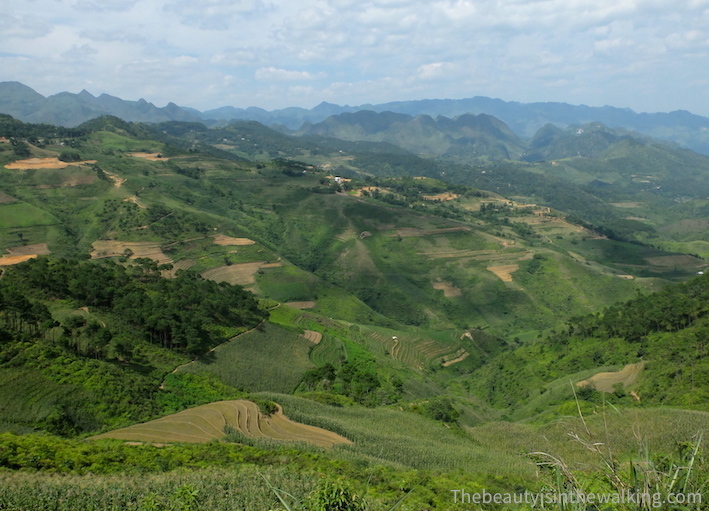 As we enter the UNESCO protected geographical area, we start riding up green hillsides. 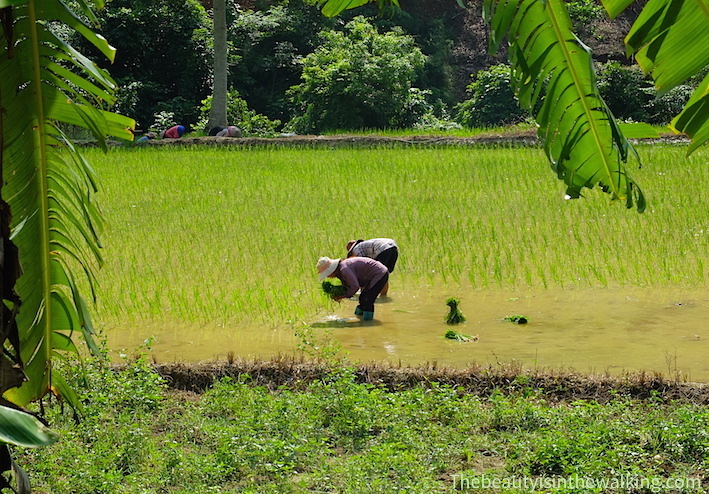 Very soon, we can catch sight of the first rice fields and terraced crops. Most of them have just been planted and are of a bright green colour, whereas a few others are still muddy but will soon turn green too. We can see people planting rice or ploughing with their buffaloes though. Corn is drying along the roads. This is the main source of income for the communities. 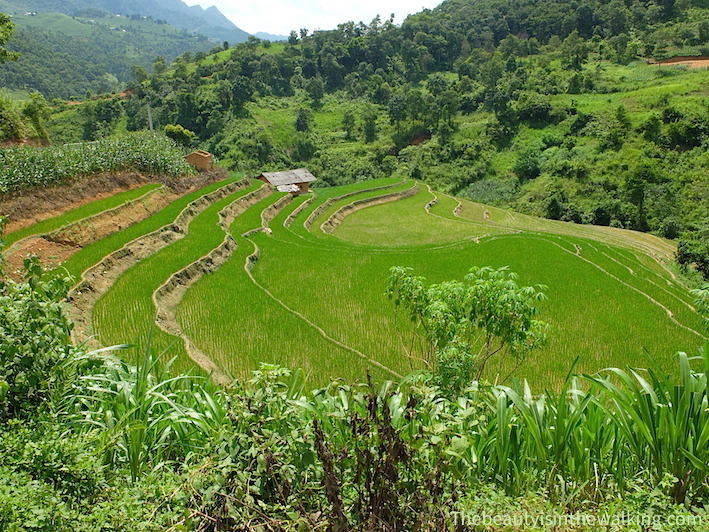 As we take height, the landscape is growing in size and rice fields are spreading down the slopes. 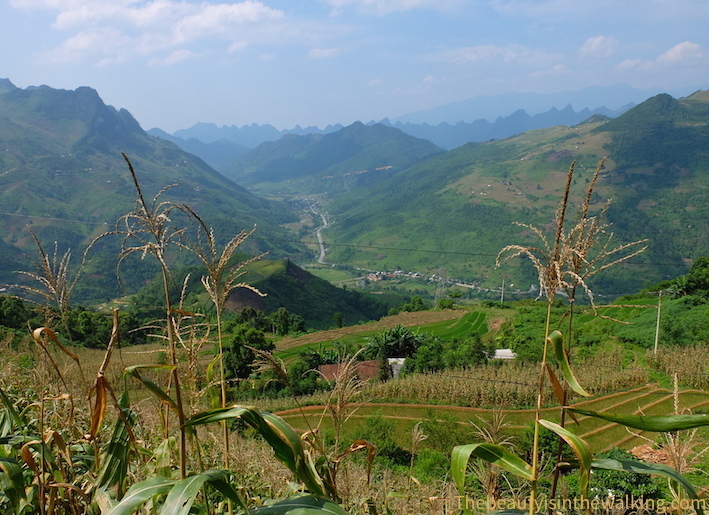 A few unusual sights add some pepper to the trip, such as the Rocky Mountains Gods, a series of sharp pointed rocks, or the Quản Bạ Heaven Gate, a pass offering an overview on the valley. 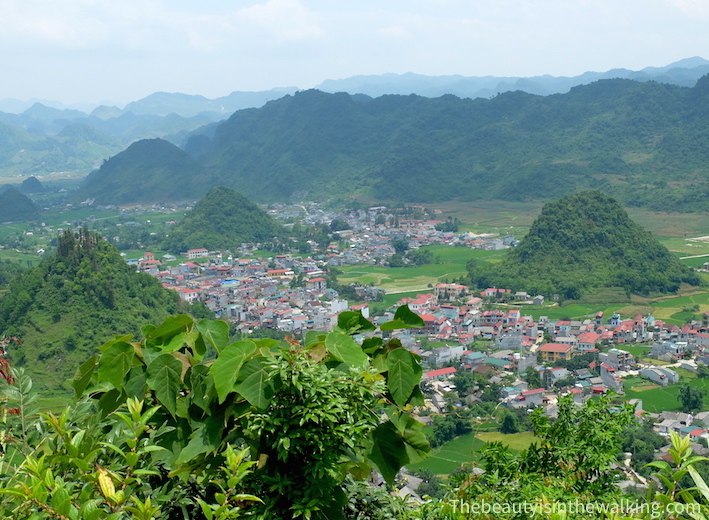 When riding down the hill, we stop at a viewpoint to admire the famous Núi Đôi (Fairy Bosom), two breasts that emerge from the middle of the rice fields. 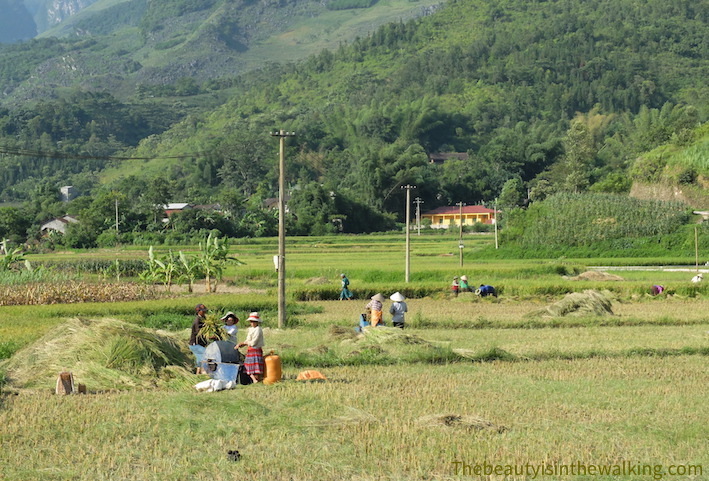 All along the road, we can see signs that show the ethnic villages: Hmong, Cai, Tay, Lô lo… As we have time, we decide to make a detour via a Hmong village of the municipality of Lùng Tám to visit a flax weaving cooperative. 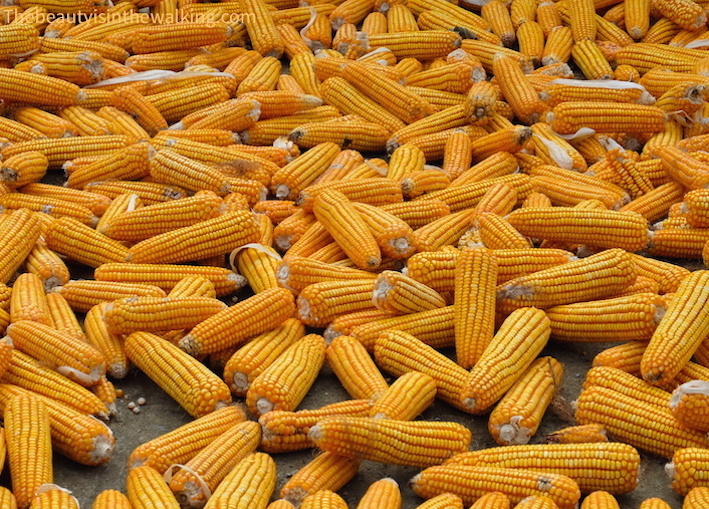 This traditional activity was brought up to date a few years ago to help the village to fight poverty – in this region people make a living essentially from growing corn. And it is a success: the cooperative employs more than a hundred villagers and now exports its products to several western countries. We turn a few meters back. I want to take a photo of these women; their beauty dazzles me. I ask them if I can but one of them answers “no” for the others. I don’t insist but say that they look beautiful. “Wedding?”, I ask. There is a real festive spirit, out here. She comes closer. We don’t have any common language but some gestures are universal: it is a funeral. My face changes and I apologize, whereas the women laugh at our misunderstanding. Death doesn’t seem to be so sad here, just respectful. Suddenly, the woman grabs my arm and tells me to follow her. I shrink back, I feel embarrassed but I ’m opened to this unexpected contact though. I’m afraid that she wants to take me to the ceremony, to show me. I understand and I don’t want to see that at all costs! I try to make her understand that I don’t want to bother them but she doesn’t listen to me and tells me to trust her. I do. She firmly holds my hand like a reassuring mother, and we start walking through the crowd who has come for the occasion. I feel like a stain on a silk fabric. They all look so gorgeous and I am so… out of place. But at the same time, it is a kind of an excuse to my naivety. Anyway people don’t pay too much attention to me: they are chatting, some are even smiling. It is so different from our funerals. So much more… lively. After walking into a first room, I take off my helmet that I had kept on. Many people are chatting. I think I saw one or two of them crying but I’m not even sure about that; I don’t want to stare at them. I’ll stay here; I don’t want to walk any further. My “guide” insists once again; she wants to show me the room at the back. I assure her that I understand: lying on a high pedestal, I can see an old lady to whom visitors have come to pay their final respects. While I’m watching, my guide shows me and comments what’s happening. I understand globally. Actually, we understand each other globally. A kind of complicity, intimacy has just arisen. This private event has brought us closer to each other within a few minutes. We are no longer strangers but simple human beings. We look like each other so much in front of this death. Background music – nasal melodies – comes from ethnic recorders with flared end played by a few men squatting. The whole atmosphere is not sad; it’s quiet. As if this day was a normal day. People are accompanying a diseased. Death is part of life. 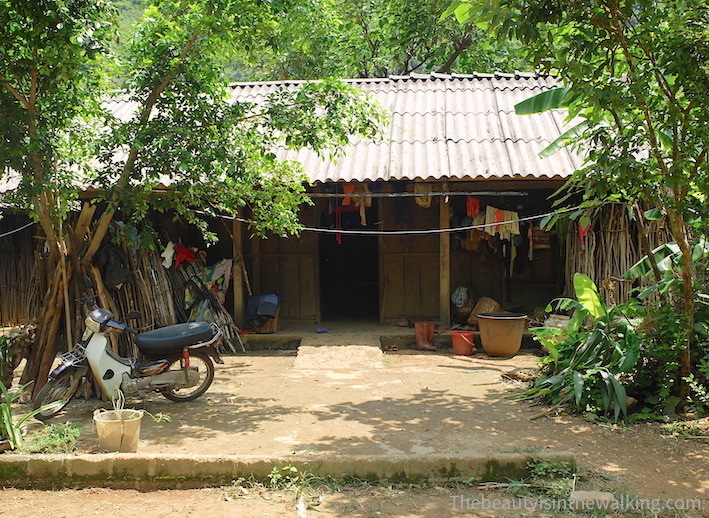 I look at the scene one last time: the earthen floor of this modest wooden house, those people who are extremely present, and feel the atmosphere of celebration. Then I look at my guide and tell her that we can go. I’ve seen enough, I understand and I appreciate her openness and friendliness. She shared a bit of her life with me, with sincerity and generosity. We are not strangers anymore. I thank her and we both wave goodbye while the scooter goes away. Our first day will end in Đồng Văn. All in all, we will do more than 150 km on mountain roads. 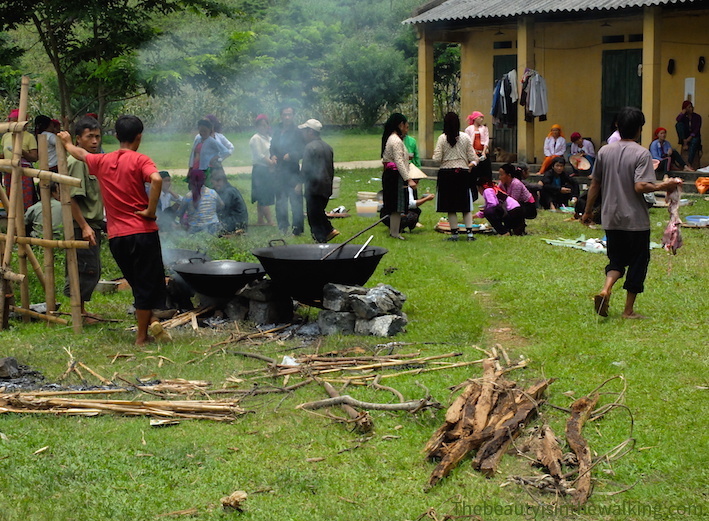 And our aim being to arrive before night falls, we won’t be able to stop at the house of Vương’s family, king of Hmong people, which is situated at around 30 km before Đồng Văn. So we decided we’d rather do that the next day. This last portion of road is even different: we have gained altitude and the reliefs are sharper. 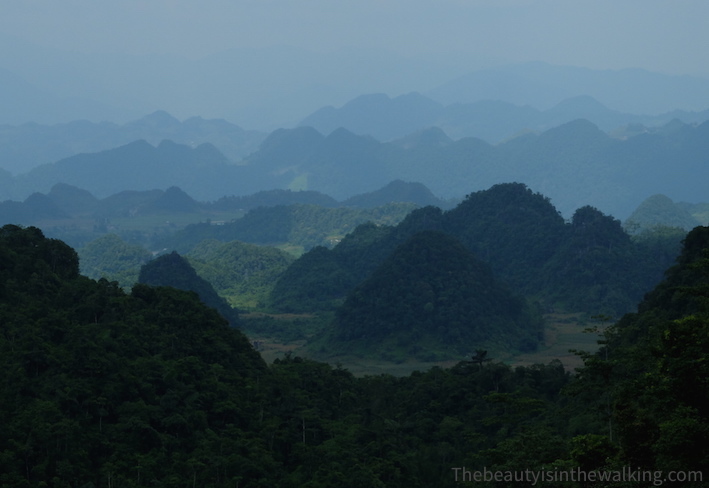 We are riding among conical peaks, covered in vegetation and sometimes lacerated by a road. 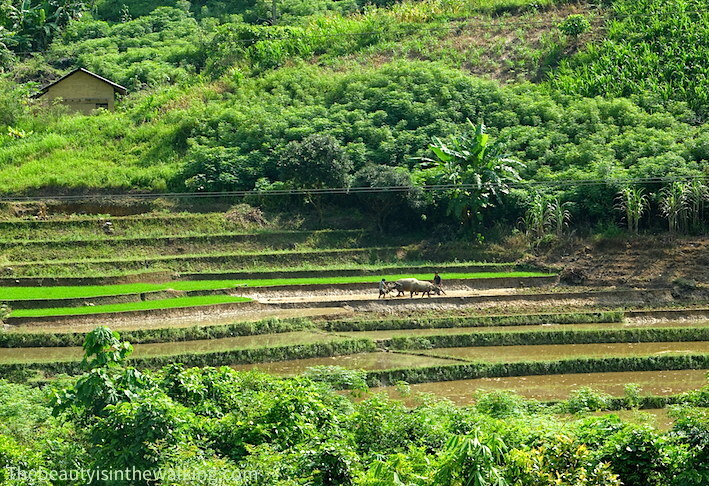 The rice terraces give way to more and more cornfields as well as to plants that bear a striking resemblance to pandan – little copses with long flat green leaves. Down in the little valleys, a few houses are witnesses of some life in such a remote place. The fresh air and the light of the late afternoon make the trip extremely enjoyable. 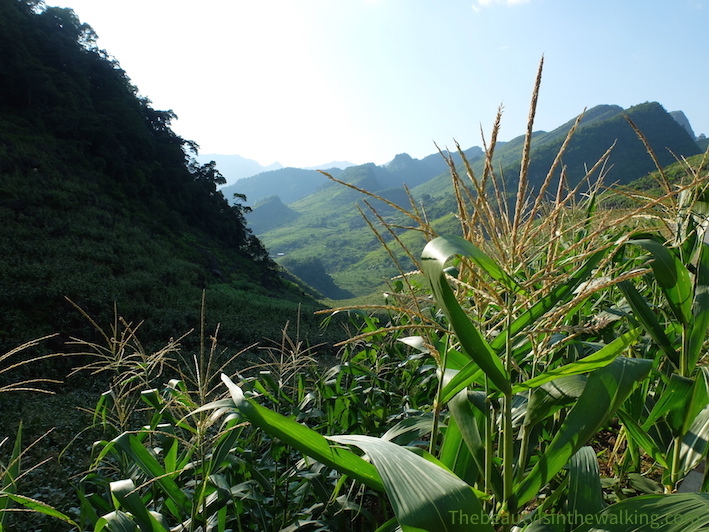 Want more about the Hà Giang Loop? The most impressive is yet to come. Read the PART 2 of our road trip! We have now been travelling for six months and we wanted to thank you for your regular comments, emails, and messages. Even if it’s great fun doing this amazing trip, it is extremely pleasant to receive some news and encouragements from you all. So, keep on going! And for those who are still a little shy, don’t hesitate to share your impressions about the articles we post; it encourages us to continue this great –although time consuming– activity which is to make you share our adventures! Many thanks! We haven’t been really sick during all our journey, except me after having eaten a suspicious papaya salad (so raw food) which caused me digestion disorders and confined me to bed for 24 hours. If you stick to cooked food, then you won’t have any problem. Water and ice are also safe in most restaurants. No vaccination was mandatory for all the destinations we went to, but (of course…) highly recommended by the specialist we met before leaving. So we took pretty much all of them. But if it had to be done over again, we wouldn’t take them all unless we plan to spend many days camping in the jungle or nature. But if you plan to travel in those regions, I recommend you to go and see a specialist and make your own opinion about that. 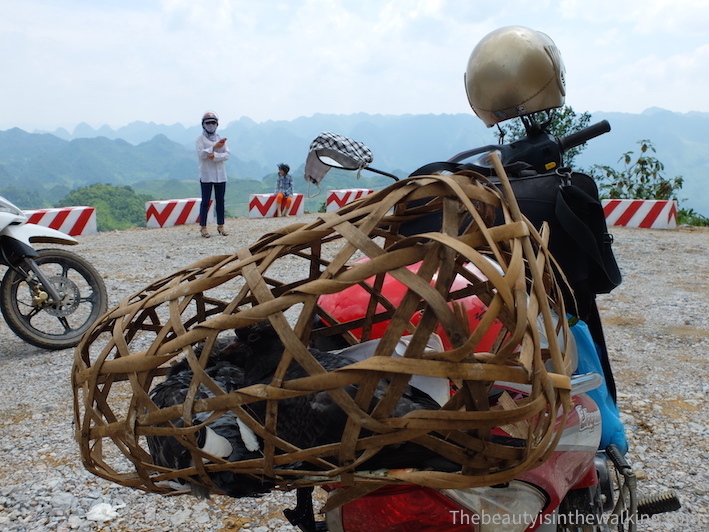 When you went motorbiking in Ha Giang, what kind of clothes did you wear? How many layers? 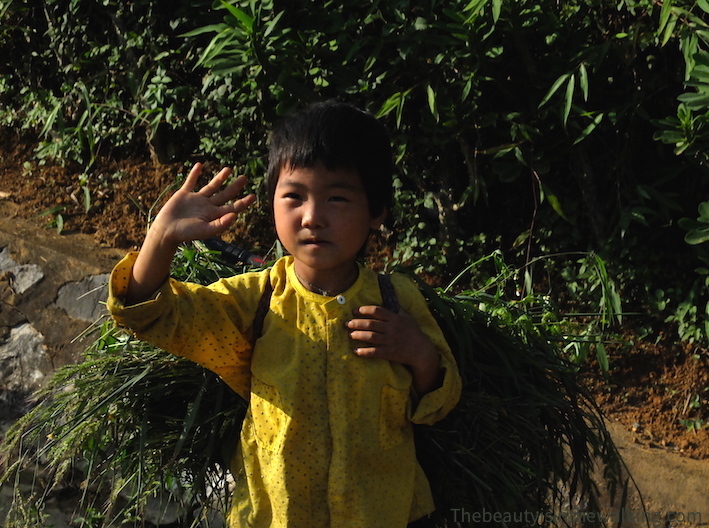 did you buy more clothes when you got to Ha Giang? 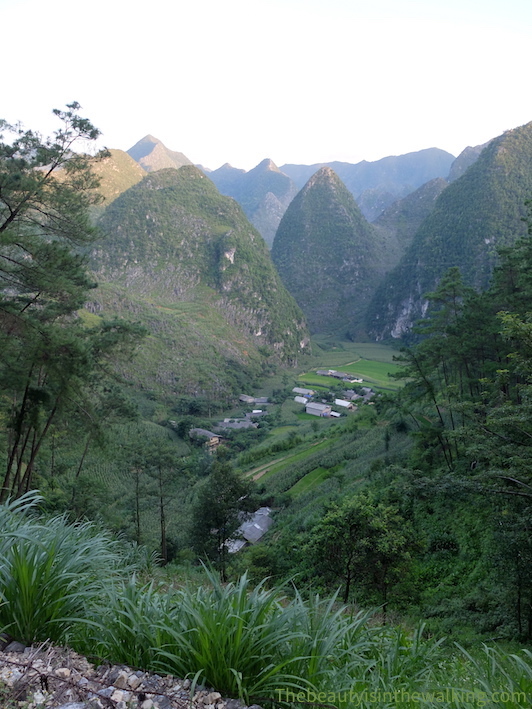 I’m going to Ha Giang in December. Does it get colder than 0 degrees celcius? We went there during the warm season so I’m not sure of what would be the weather like in December. We wore layers of clothes to protect ourselves from any motorbikes accident rather than for the cold. However, you can have a look on Tom’s blog. He’s a guide and rider; he has been living in Vietnam for more than 10 years and gives awesome advices on his blog. 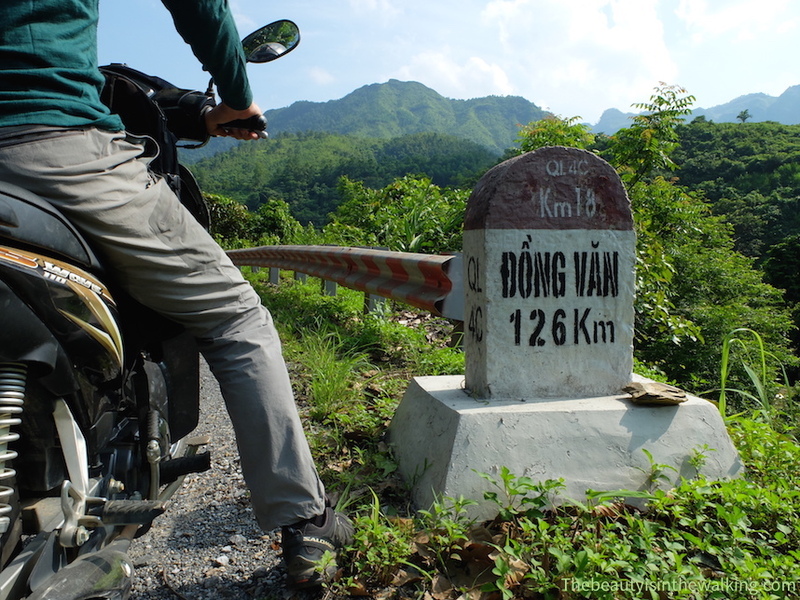 I’m sure he can help you with your question: http://vietnamcoracle.com/ha-giang-extreme-north-motorbike-loop/. Good luck, and have a good trip there! I would be interested to get your feedback about this loop in December when you’ll be back!